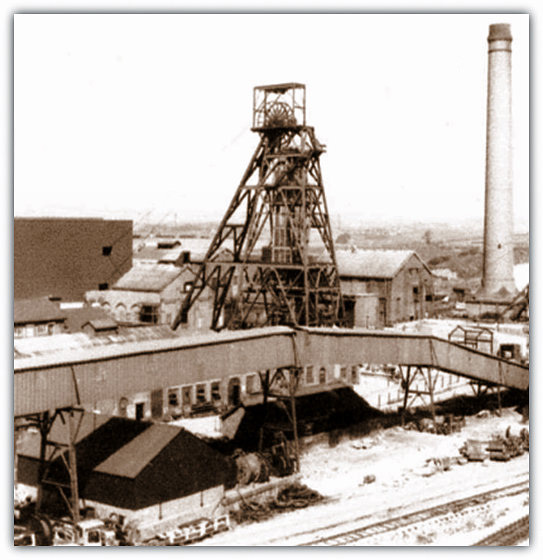 Markham colliery (North Derbyshire) was closed on 2nd July 1993 after 109 years. Shaft positions: No4 shaft SK47SE 445013, 372305. 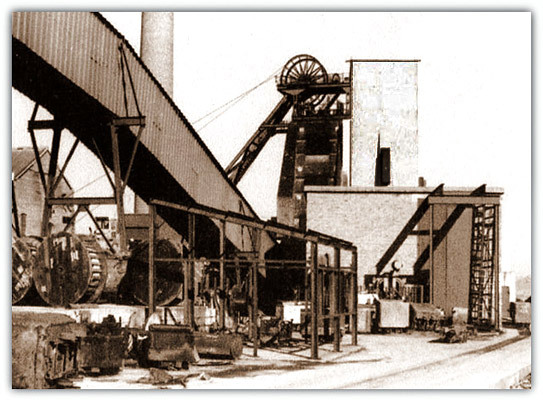 This mine situated to the north west of Bolsover and to the west of Shuttlewood and now by the side of the M1 motorway was a combination of pits Nos 1 and 4 with 4 shafts in one pit yard in 1967. No1 was sunk 1882/86 to Deep Hard, deepened to Blackshale 1926. Return airway and second means of egress from this level was by a staple shaft winding system in lower part of No4 shaft. No2 shaft sunk in 1886 by the Staveley Coal and Iron Co. On 1st Sep 1967 Markham 1,2,and 4 were merged into one mine named Markham. Threequarter 1952-3/2/1990 (0.90m thick) and Blackshale -1993. John Rippon Geologist, was fairly sure that the Upper St John’s seam was worked in the shaft area, however there are no plans in existence. No4 shaft 17 feet (5.19m) dia, 695 yards (636m) deep UC, winder drum 1,342kw. No2 section 1,100 tonne bunker. Surface: screening Drewboy 229 tph, cyclones 366 tph, Baum 305 tph. Dirt: mobile Aveling Barford dumpers, grader and bulldozer. Pithead baths opened in 1938. Hand held battery lamps pre 1947 before cap lamps were introduced. Ponies were used in the Blackshle also. Palterton was absorbed in 1918, shaft position SK 446002,369175, 14 feet (4.27m) dia, 246 feet (+75m) above sea level, depth to Top Hard 184 yards (168m), shaft bottom 196 yards (179m). Markham No1, No2 and No4 merged 1st Sep 1967, and Ireland colliery was absorbed into the complex on 1st Oct 1986 as No5 Section of Markham. It was a huge complex. An extra Deputy Manager and other supporting staff were appointed for the reconstruction. There was a changeover to 3 deck cages with tilting deck to allow long materials to be loaded onto the cage instead of slinging beneath the chair. The Training centre at Markham was closed in 1955. 6 Undermanagers: CM Kent (11289), R Lane (11070), PE Ward (9765), R Seward (11558), JA Kelley (11276) and Mark RH Hoare (11126). There were also some Assistant Undermanagers. 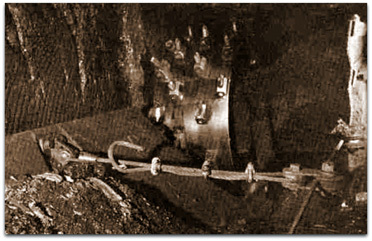 Extra small coal passed through a crusher in the pit bottom area delivered it to a pipe app 1’ 0” (0.30m) dia and lifted up the shaft by hydraulic means to increase the shaft capacity of winding in the late 1950s. In 1960 a 70hp uni-di Anderton shearer and AFC was installed but the face supports were still props and bars. The rippers at the time kept up with the face advance because they were on contract and as they say, ‘money talks’. A Mawco cutter loader was installed working on end coals. From Jan – Aug 1964 the face machine was a 70hp single ended low seam trepanner which was changed for a 70hp Anderton shearer with Gullick 5 leg face supports. No4 steam winder was changed 1969. Rapid loader plant operational 1970. New headstocks at No1 shaft 1975. A chimney built in 1939 was demolished in 1977. An electro magnet was installed on the screens in 1978. The Baum washer throughput was 250 tons per hour. 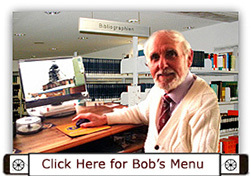 New offices were opened in 1980. A rapid loading bunker was built. Coal mainly supplied to power stations. A Gleithobel heavy duty Rapid Plough and open bottom AFC pans installed next with Dowty double-telescopic thin seam supports with short stable holes and advanced heads was superseded with CM Trepanner Apr 1973 and Dosco MkII Road headers. However due to high maintenance costs replace by firing and load out by Eimco 625 bucket. There was an ignition of firedamp in May 1973 when the cutting auger struck some incendive sandstone. 2 more ignitions followed in the following year. The use of a hand-held methanometer monitoring was deemed onerous and in Jan 1975 an MR3 methanometer with flash alarm attached to the conveyor mounted trepanner was a failure. In 1977 MSA Automatic Firedamp detector proved successful and was introduced to all mines. The ignitions were common in the Threequarters seam at nearby Ireland also, the seam at both pits having a quartz-rich floor, and sometimes roof also. Note that the sandstone itself is not incendive – there is a high incendive risk of cutting quartz-rich rocks with metal in a methane-prone atmosphere, the relevant heat being from friction at the pick surface (and not from the produced sparks as often quoted) – John H Rippon Geologist. Shield support technology first designs trials were at Markham and Savile in the mid 1970s, the first full face installed at Kellingley, Yorkshire. A face in Piper seam, 266m long and 1.15m thick achieved 18,616 tonnes in a week in May. It was equipped with 2 x AB 16 shearers and supports on the face were Gullick Dobson 5x200 chocks. This face helped to achieve a weekly output record for the mine of 62,405 tonnes in May 1991. The previous record was 60,630 tonnes. 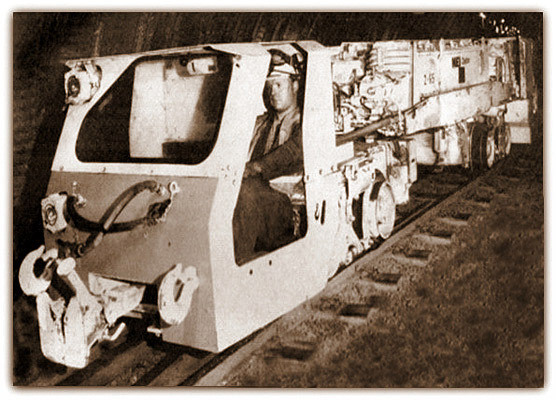 Four 50hp Clayton Pony materials locos (Photo Right) specially designed to a low height of 1.4m and 1.37m wide and weighing 10.7 tonnes and 3 times as powerful as standard locos were installed for high speed in-seam work allowing smaller gate profiles in the 2nd Waterloo. An exemption from the Mines Inspector also allowed the new locos to push as well as pull thus saving valuable time on shunting. In March 1989 there was an inrush of water from old workings? but no adverse effects stated. Markham was the last deep mine in North Derbyshire to close. Tongue opencast site was nearby. Derbyshire Coalite Co Ltd was 655 yards (600m) to the East of Markham No2/3.